Mo Chung fights the tiger again? Who pulled out eyes of these Siberian tigers? Both of the Siberian tigers, whose eyes had been gouged out, are crying in the cold wind, Chinese netizens angry. Do you have any sympathy? See Siberian Tiger Pictures above (东北虎 Dongbeihu). 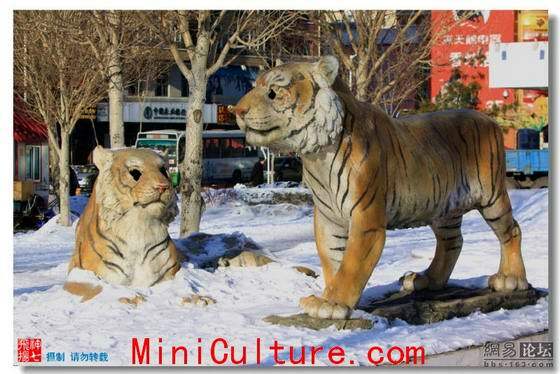 There stand the stone carving sculptures of two tigers in the landscape garden, which is located in Korea Customs Street, Xiangfang District, Harbin City, China. The paints on the sculptures have been chapped and faded, as a result of exposing to the weather and having been neglected for a long time. What’s more, the eyes of the two tigers were gouged out by some unknown adventurous “heroes”, and the tail of one of the tigers was broken and disappeared. Here we could conclude it as this poem: In the ancient, Wu Song the great hero killed a fierce tiger; today, an unknown “hero” carved out the eyes of sculptured tigers. A real version of Mo Chung fights the tiger. What is Siberian tiger? The Siberian tiger (also known as the Amur, Korean, Manchurian, or North China tiger) is the largest and most powerful subspecies of naturally occurring feline. Do you have ever challege a Siberian tiger? Shooting by Mini Culture on March 17, 2010, PM. Netizen Xue zhongfeilong: Who had provoked you? It’s so bloody to gouge out their eyes. 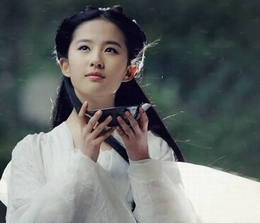 Netizen Hu xiaying24: Poor tigers. Internet User Resonly Luo: I was regularly cheated, I have thought it must be a serious thing. It’s only a status, it’s easy to be broken for exposure to the weather. If it has been OK for thousands of years, what should the sculptors do? Internet User xcwxs2002: Bad behavior. Internet User Kairel18: The true tigers were starved to death, moreover it’s only a sculpture, if there is no value in use, national treasures would be ignored either. Chinese Netizen Qin shuiwan: who is responsible for the tigers? Certainly not folk. Barbie Hedgehog: Babiciwei needs donations to repair. Netizen Mu Lang: they should be recovered earlier. Chinese Netizen Abcd198795: I reckon this should be man-made, it shows a problem that the people in our country have poor quality. Danruo xiangcao: Could it be that someone was too hungry? The Siberian tigers, whose eyes had been gouged out, are crying in the cold wind. Do you have any sympathy? Sad? High Doses of Vitamin D Is Healthful or Harmful?